For companies looking to improve logistics, one of their goals could be not just greater visibility, but also stronger collaboration with other businesses. This idea comes from Supply Chain Quarterly, which recently examined the idea of "collaborative technology partnerships" for better sourcing. However, there are multiple ways to approach collaboration in planning, so let's look at three of the processes potentially pointing the way forward. If collaboration is all about including more participants in the supply chain, then digitizing seems like a necessary step for the future. In an article for Manufacturing.net, Tyson Foods Senior Director of Business Process & Systems John Buckley described his company's approach to collaboration in the wake of new technical advances. As he puts it, the chance to share directly with third-party partners and suppliers should give businesses "even greater power" than was previously the case with data. Distributing important information among the supply chain can increase its value, Buckley argued, and also give companies a simple way to reach out to their consumers, who are often as hungry for information as the suppliers are. With better communication between parties, businesses may be able to make sure customer demands are driving all different parts of production. In an article for Apparel, Michelle Covey of GS1 US said that the tighter relationships are making meeting business audiences easier, as the endpoint stays in sight. This gets at a point behind many different positive innovations: Something which is good for the supplier is also fundamentally good for the customer. Another example of a customer-targeted change comes from Chain Store Age. This source said that Nebraska Furniture Mart has used its new chain to cleanly coordinate business, again with the final goal of a better customer experience. The store's supply chain and logistics general manager, Scott Hansen, explained the thought process behind this. "Our customers look to Nebraska Furniture Mart to provide a wide selection of products and excellent customer service at a fair price," Hansen said. "The integrated supply chain planning and execution solution has helped bring all departments together onto a single platform to communicate in a common language. The bottom line, we have achieved more effective inventory investments and better customer service." Just as businesses share data to improve customer service, they may also need to counter security threats that threaten multiple points at once. But with increased digitization comes the risk that hackers might have more information to target, making supply chain risk a chief concern. According to a Forbes survey, the amount of businesses that are most worried about security issues could continue to rise. Out of 1,408 respondents, 30 percent believe that IT and security incidents are very concerning. Unlike other supply chain issues, this one has been at the top of the list for several years, maintaining a high spot since 2012. As such, the source said that the future of collaboration could also require some security measure that makes consolidating processes less risky. In all of this, enterprise continuity is a common thread. 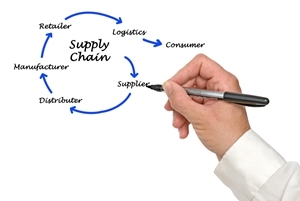 Supplier relationship management can keep complicated processes aligned with company goals.